Parenting is one of the hardest and unpaid jobs but it is the most fulfilling work of all. A single mother of five is currently taking the internet with a buzz as her story of success inspires everyone. The powerful woman on the photo is Ieshia Champs. Ieshia dreamt of being a lawyer since she was seven years old. However, her dream seems to be impossible as she encountered different hardships in life. According to an interview with CBS News, Ieshia did not have anyone to look up to while she was growing up. Her mother was addicted to drugs, and her father was already deceased. She lived with whoever would take her in. Things started to change when she got pregnant with her first child and to sustain her growing family's needs, she stopped studying and took a call center job. When she got pregnant with her fourth child in 2009, Ieshia suffered a series of mishaps. She lost her home and all the family's belongings to fire. She was jobless. Cancer took the life of her children's father. As a result, she had depression and lost her sanity. With all the problems that she was facing at that time, she tried to end her life. After this event, Pastor Louise Holman called her and told her to go back to school because she will become the lawyer that she wanted to be. She was hesitant at first. She thought that she was too old and her fourth child was on the way. But with her faith, she listened to what her pastor said. Ieshia went back to school and is now set to graduate from Texas Southern University's Thurgood Marshall School of Law this May. 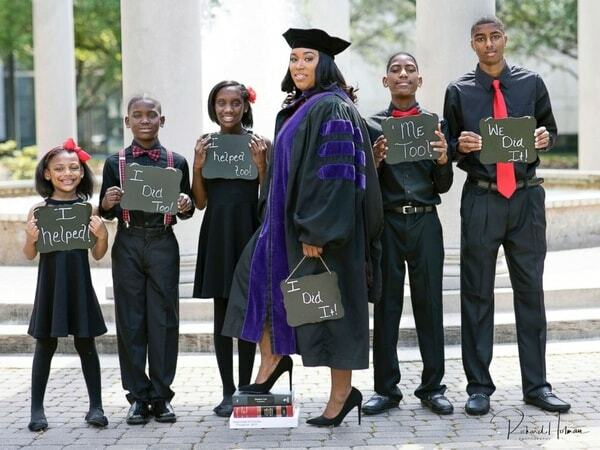 A pre-graduation photo of her together with her five kids has gone viral. Ieshia stated, "I took the pictures with my kids because they helped me through school. They're graduating too!" She said that her children helped her in achieving her dreams. Her children would help with her review by fashing cards while she cooked. They would also act as mock jury while she explained what she had learned that day. There are times too when her oldest son would take care of his siblings. Ieshia concluded, "Looking at that picture reminds me of the fact that I didn't just defy the odds, me and my children destroyed them." Her story is an inspiration to everyone. With faith and determination, she shows us that everything is possible.